Wellingborough’s driving test centre is facing closure again. 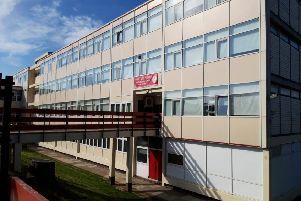 Glamis Hall in Goldsmith Road became the official test centre in September 2016, months after the old centre at Halfords closed. It offers tests to learners on Tuesdays and Thursdays but the Driver & Vehicle Standards Agency (DVSA) has announced its last day of operation will be April 11. Heather Saunders, chairman of Glamis Hall For All, said they had not been told why the centre will close. She said: “We at Glamis Hall are very disappointed indeed that the DVSA have decided to close the overspill test centre. “We have built up an excellent relationship with the examiners and driving instructors who have used our premises twice a week for the past two and half years and will be very sad to see them go. “We had hoped the DVSA might increase the amount of days they used the hall as a test centre as we understand that there is always a long waiting list in Wellingborough and were surprised to receive notice of termination by email last week with no reason stated. “This loss of revenue, accompanied by the uncertainties surrounding the funding we receive from both Northamptonshire County Council and Wellingborough Council due to the move to unitary councils, puts greater pressure on trustees and staff responsible for balancing the budget. When asked by the Northants Telegraph, the DVSA did not say why the centre was closing. DVSA director of operations south Richard Hennessy said: “The DVSA’s priority is to help you through a lifetime of safe driving. “The temporary driving test centre at Wellingborough only opens for two days a week. “Using the nearby test centres at Northampton and Kettering we will be able to provide all candidates with a more consistent service, seven days a week. Between April and September last year, Wellingborough’s test centre had a much higher success rate than its two county counterparts. Of the 393 learners taking their test at Glamis Hall 59.8 per cent passed, far higher than the 52 per cent success rate at Kettering and the 48.9 per cent success rate in Northampton. Kettering driving instructor Adrian Stear, who has had some pupils take tests in Wellingborough, said: “It’s a shame because Wellingborough has quite a big population so it’s useful to have a test centre there.